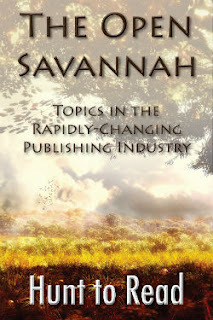 Hunt To Read: The Open Savannah: Book Season? Yesterday, we hit September's halfway mark, which is honestly kind of tough to believe. As writers, we're often told that June-August is the so-called "slow season," when people go on vacation, play outdoors, and essentially turn their attention to non-reading pursuits. To be fair, back in college, I read a lot for fun--much more than for class, but that's a different post for a different day. So maybe that has something to do with these shifts. For some reason, a lot of folks simply don't get back into the swing of their reading habits until Labor Day, which is cool--far be it from me to tell people how to read!--so Authors eagerly await the uptick in sales that should accompany the return of book season. I say "should" because I know some folks have been complaining about an "off" sales month on Amazon. I'll admit, my sales are a bit underwhelming thus far this month, as well. But my question to you is "why?" Is it as simple as a change in Amazon's recommendation algorithm? Seasonal changes in books would point to the weather being a factor--it's perfect in the entire eastern half of the U.S. right now, but kind of terrible out west and honestly I don't want to list how it is in the rest of the world because you could easily go to weather.com to find that out! What's the driving force behind the start of "book season" in the fall? Let us know in the comments.